Circulating Now welcomes guest bloggers Tatjana Buklijas, Birgit Nemec, and Katrin Pilz whose recent essay “Erdheim’s Autopsy: Dissection, motion pictures, and the politics of health in Red Vienna” on the NLM website Medical Movies on the Web discusses a fragment of silent film in the NLM historical collections: Herr Professor Doktor Jakob Erdheim, 1933, which depicts the undertaking of an autopsy. Sometime in the last century a fragment of silent film landed at the National Library of Medicine. Like many of the older films in the collection, how it got there is a mystery: no paperwork survives to tell the tale; no other prints of the film appear to have survived; no other sources on its making or showing have turned up. The film itself gives no direct information on its origins or purpose. 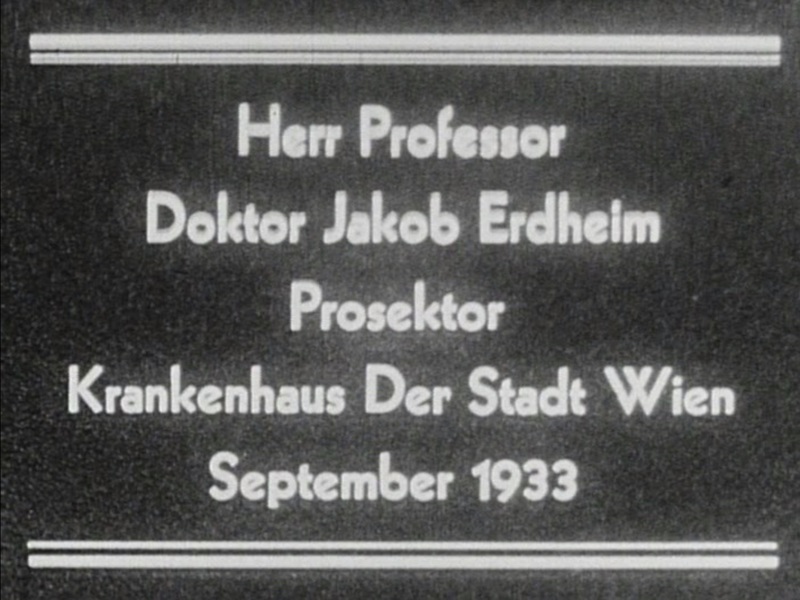 It has no real title or credits, only a single intertitle that tersely announces the featured player, setting, and time: “Herr Professor Doktor Jakob Erdheim Prosektor. Krankenhaus Der Stadt Wien. Septem­ber 1933.” What comes after that is extraordinary, a minor landmark of medical cinema: an autopsy, perhaps the first ever performed before a motion picture camera. On screen, a bespectacled man in a white coat happily cuts open an unidentified dead man, chatting all the while with students and colleagues. We don’t know who planned the making of the film, who paid for it, or who provided the equipment. Most likely it was the genial autopsyist himself, Jakob Erdheim (1874–1937), a pioneering neuro-endocrinologist and cranial pathologist, and an important figure in medical research and the Vienna public hospital system. The grainy black-and-white footage has the casual amateur feel of a home movie. Even so, it gives us a tantalizing glimpse of Erdheim’s skills, character and work. And documents an important location in the exemplary municipal health and welfare network that was forged in the contentious politics of Austria in the era between the end of the First World War and the start of the Second. 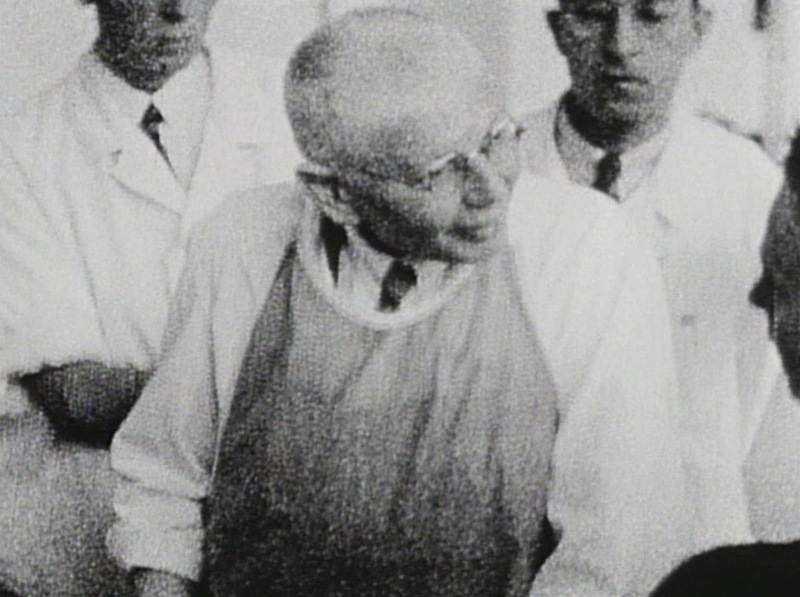 In 1933, Erdheim was at the peak of his career, the head of the hospital’s Department of Pathological Anatomy (today the Jakob Erdheim Institute). Surrounded by white-gowned students and colleagues, he dissects a cadaver, while colleagues at a side-table work on a body-part. The evident pleasure with which he conducts his brief anatomical performance is an odd sight in the medical cinema of the 1930s: contemporary anatomists and surgeons only rarely appear on screen, and if they do appear, they assume a more sober demeanor. But Erdheim gesticulates, chats, smiles throughout. He begins the autopsy with a flourish, uses his scalpel to make a swift and certain Y-cut (the procedure still used today to open up the body in autopsies). He then dissects the chest, cuts the ribs open, examines the lungs. Extracting the major thoracic organs, he places them carefully alongside the corpse. He then works towards the pituitary gland—one of his main research interests. The camera doesn’t show Erdheim peeling down the skin of the face—is he deliberately sparing the viewer this difficult scene?—but it does show him removing the scalp and examining it for a moment. He then takes a small chisel to detach the part of the skull that covers the area of the pituitary gland. Later we see him remove and clean the brain, before he turns to his audience, apparently explaining the structures at the base of the gland. 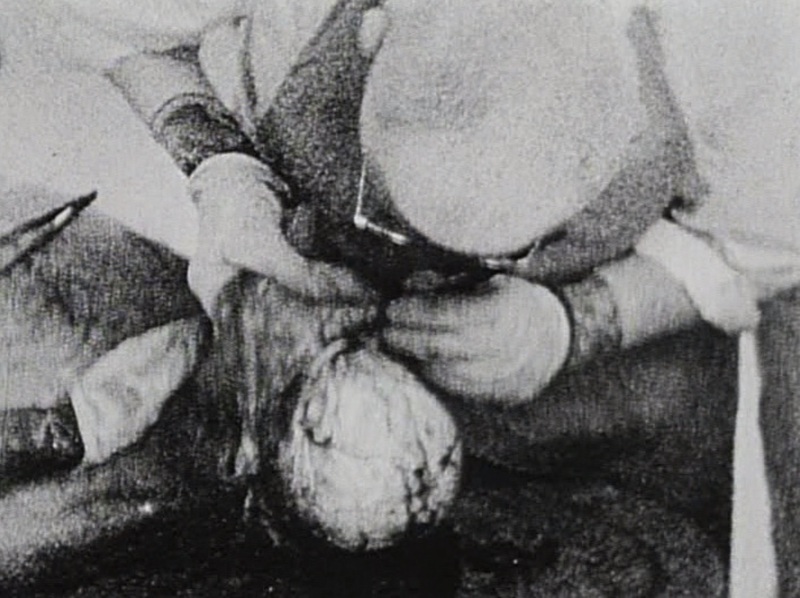 Erdheim at work on the cadaver’s brain. Erdheim’s road to prominence as a clinician and scientist was typical of his generation. He was one of six children of a mine-owning Jewish family in the eastern province of Galicia (then a part of Austria-Hungary, today part of Poland). His family moved to Vienna during his childhood, in the big wave of Jewish immigration from the east that followed the Austro-Hungarian constitutional reform of 1867. Erdheim graduated from the Vienna Medical School in 1900, then joined the Institute of Pathological Anatomy of the University of Vienna. He trained under Anton Weichselbaum, was later promoted to assistant, received his teaching license in 1913, and was appointed to an extraordinary professorship in 1916. The Imperial Jubilee Hospital’s department of pathology, the first such unit to be established outside a university hospital, was founded in 1913. Within the hospital’s park-like grounds, a modern morgue was constructed and given a prominent location next to the tuberculosis pavilion. In 1923, Erdheim succeeded Rudolf Maresch as head of the department of pathology. Once appointed to the chair, Erdheim became the city’s premier pathologist. Erdheim worked hard, slept little, hardly ever left the hospital (which had been renamed Lainz after the end of the war and the overthrow of the monarchy). A loner who never married, he had few close friends and was regarded as an eccentric, but was well liked by those who knew him. He was not active in the politics of interwar Vienna, but as anti-Semitism grew and political differences sharpened, he experienced difficulties. Even in earlier times, Jewish academics were often prevented from getting university appointments, but the increasingly contentious racial politics of the time made a university career path more problematic, and likely pushed Erdheim into the municipal hospital system. Independently wealthy (he inherited oil-rich land in Galicia), he evidently had some Zionist sympathies and used part of his inheritance to build a pathological institute in Tel Aviv. Erdheim engaged in discussion with colleagues and students. The fragment of film that was handed down to us has almost nothing in common with contemporary medical, public health and hygiene films, which often mixed in voice narration, composed soundtracks, fictional elements, and anatomical diagrams with clinical settings. Instead, we see something very real, a bit of cinema verité—Erdheim relaxed, interacting with students while performing a dissection, a private documentary that captures him joyfully doing his work, a little bit of screen magic that very modestly, intimately, capitalizes on the uneasy thrill that viewings of dissections, cadavers and death can provoke. Erdheim made his film in 1933, the last year that the left progressive Social Democratic party governed Vienna. In 1934, the Catholic Austro-Fascist party came to power in a coup. Life for Social Democrats and other political opponents became difficult but a bit safer for Jews. (The new ruling party, ostensibly hostile to Austrian Jewry, managed to protect Jews from violent attack better than the Social Democrats had—and Nazi terror was for a short period banned.) Erdheim was able to keep his position as head of the Lainz pathology department. He died in 1937, at age 63—a post-mortem examination revealed the cause, a heart attack. A year after his death, the armed forces of the Third Reich crossed the border and annexed Austria (the Anschluss). The Nazis took control of Austria. Erdheim never had to witness and suffer from the wave of dismissals and persecutions that followed. In those dark days, his friend and pupil, Ernst Freund, rescued a large portion of manuscripts, drawings and other materials that Erdheim had saved to document his work. Freund moved from Vienna to Florence and then to the U.S. We do not know for sure if Professor Doktor Jakob Erdheim came to the National Library of Medicine as an indirect gift from Freund, but it seems likely that the extraordinary film fragment presented here was once part of those precious holdings. To read the full essay and see the film go to the NLM website Medical Movies on the Web, a curated portal including original research on selected films from NLM’s collection. Tatjana Buklijas is with the Liggins Institute, University of Auckland, New Zealand. Birgit Nemec is a Research Fellow in the Department for History and Ethics of Medicine, Heidelberg, Germany. Katrin Pilz is a PhD Fellow at the Université Libre de Bruxelles as well as a Researcher & Teaching Assistant in the Department & Collections of History of Medicine, Medical University of Vienna, Austria.